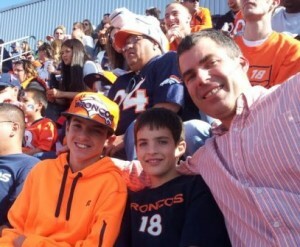 The Williams boys at Sunday’s Broncos game. I saw Elway in person many times, but never more memorably than when Vail Daily owner Jim Pavelich treated his staff to a Jan. 4, 1992, AFC Divisional playoff game at old Mile High Stadium between the Broncos and Warren Moon’s Houston Oilers. Elway led one of his patented last-minute fourth-quarter drives to victory – including fourth-down conversions — and pandemonium quite literally ensued. But none was bigger than Todd Helton’s 2,500th hit just last month at Coors Field, a double I had the pleasure of witnessing with all three of my boys in tow. So it was fitting that when they attended their first Broncos game on Sunday, the newly retired Helton – Manning’s backup QB at the University of Tennessee — was honored before the game.